While we’re on the theme of excellent dishes to bring to barbeques/potlucks, both of these fit the bill. I hope you’ve been checking out your local farmer’s market recently, and if you have you probably have lots and lots of strawberries (and not too much other fruit yet, unfortunately). 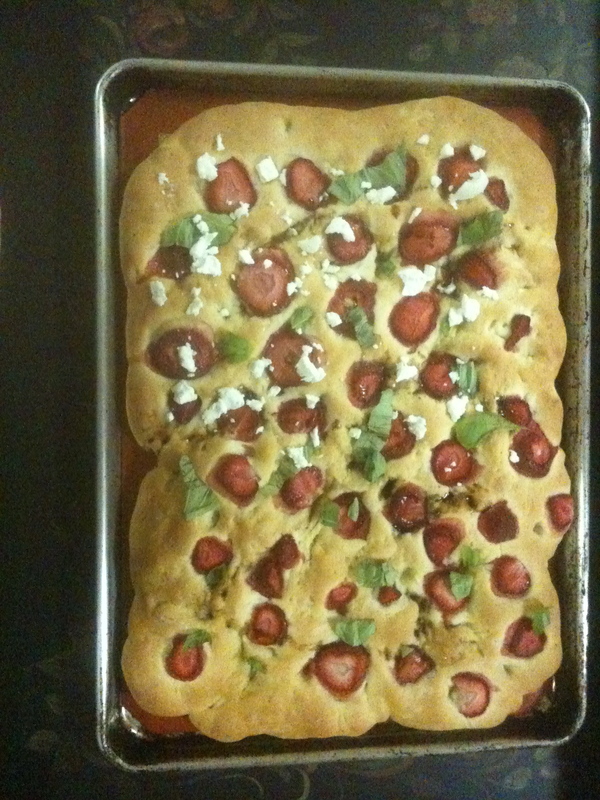 The first dish, a strawberry-balsamic flatbread-y thing, is awesome because it allows you to use up those strawberries even if you don’t want to make a dessert! The dough was also so much fun to work with– really pillowy and soft, it was very easy to knead, so don’t be put off by that. I did end up thinking the bread was a little dry, however– I might reduce the baking time next time. I also don’t think the bread itself would suffer from adding a few more flavorings (though this could be because I forgot to add the salt till the last minute. D’oh). 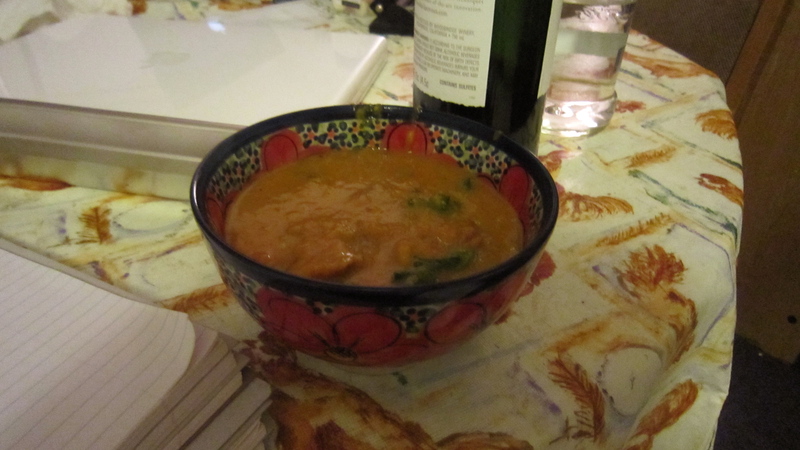 But even as is, this was a delicious addition to a potluck my friends and I had last week. 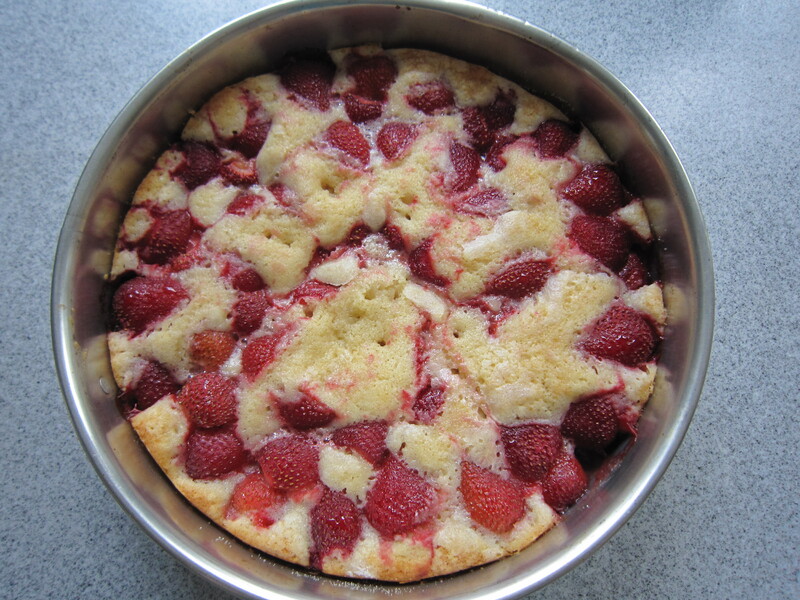 The second dish is a super simple strawberry cake. Though it takes a little time to bake, it’s perfect if you want a dessert to use up a ton of berries and wow your friends (or yourself), without spending a long time messing with pie crusts or anything like that. My batter was a little thick and absolutely COVERED in berries, so I was a little unsure that it would rise up as shown in Deb’s pictures, but it turned out looking absolutely amazing. My one tip would be to layer up more on the edges than in the middle… the middle became basically a pool of strawberries on my cake, which was delicious but perhaps not optimal. So hurry down to the farmer’s market (or, ok, the supermarket) and snap up some strawberries before the season’s over! In a large bowl, sprinkle the yeast over the warm water. Stir with a fork to dissolve and break up any clumps. Add one cup of flour and blend together until smooth (can use the fork). Cover with a tea towel and set in a warm place to rise for 1 hour. If your oven has a “proof” setting, and there is no warm place in your house, you can use this. After the mixture has risen, remove the covering and stir in 3 tablespoons of olive oil, sugar, and orange zest. Add one cup of flour and stir to blend. Add the remaining cup of flour and salt and work together into a dough with a wooden spoon or your hands. Punch the dough down and knead for just a minute, before pulling and stretching the dough into a 16×9-inch rectangle (a little smaller than a standard baking sheet). Place on a greased baking sheet and let rise, uncovered, for 30 minutes. Place a rack in the center of the oven and preheat to 375 degrees F.
When dough has risen, use your fingers to make random indentations in the puffed dough. Drizzle with olive oil (carefully, it is difficult to not have it all go in one place!). Top with sliced strawberries, and sprinkle with coarse sea salt. Bake bread for 30 to 35 minutes, until golden, crisp and baked through. As noted above, if you want it a little softer, perhaps bake for a little less time. If one side is browning faster than the other, rotate the pan once, halfway through baking. Remove from the oven and allow to cool for 10 minutes. Chop mint or basil and crumble goat cheese. Drizzle with balsamic vinegar, and then sprinkle with herbs and goat cheese. Slice into twelve pieces with pizza cutter. Serve immediately, it only really keeps for a day. 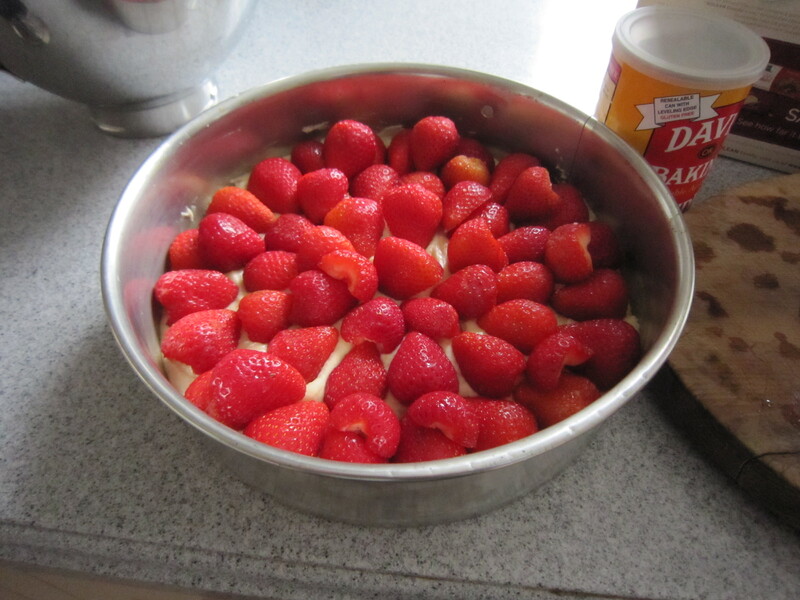 Method: Hull and halve the strawberries, set aside. 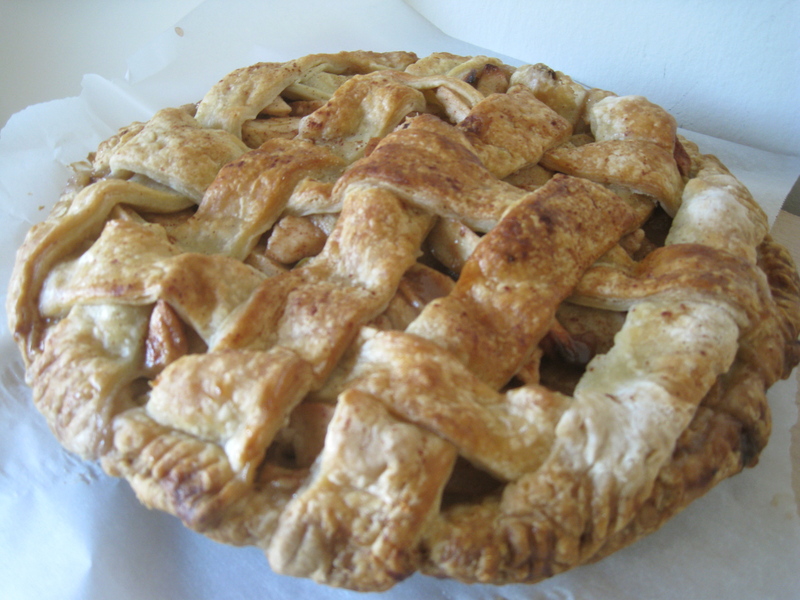 Butter your 9 or 10-inch springform/cake pan, or 10-inch pie pan (or 9-inch deep-dish pie pan). Preheat the oven to 350 F. In a small bowl, whisk together flour, salt, and baking powder. Set aside. In a larger bowl, beat butter and one cup sugar together with an electric mixer until pale and fluffy, about three minutes. Mix in egg, milk, and vanilla until just combined. Mixture may look slightly curdled, this is fine. Add dry mixture gradually, mixing until just smooth. Pour (or spoon, in my case) into prepared pan. Spread mixture evenly, if needed, and arrange strawberries on top, cut side down, in as close to a single layer as you can get. 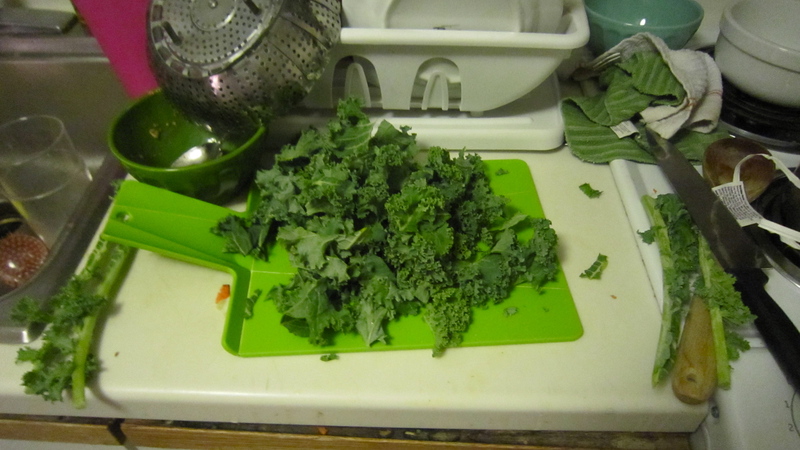 (I had to overlap them a bit, and ended up using just shy of a pound because I felt there were enough on there.) Sprinkle remaining two tablespoons sugar over berries. Bake cake for 10 minutes, then reduce oven temperature to 325 F and bake for another 50-75 (my time) minutes, until golden brown and a tester comes out free of wet batter. I found I was still getting some crumbs sticking to my tester after quite a long time, but eventually decided that was just due to the moistness of the cake. Let cool in pan on a rack, and serve. It should keep for two days, lightly covered, at room temperature. I think there are definitely some foods that are easier to cook if you grew up watching them being made in your kitchen. I may not have picked up the exact recipe for risotto from my mom, but I made a pretty good version on my first attempt because I knew what the technique was all about from watching her make it many times. 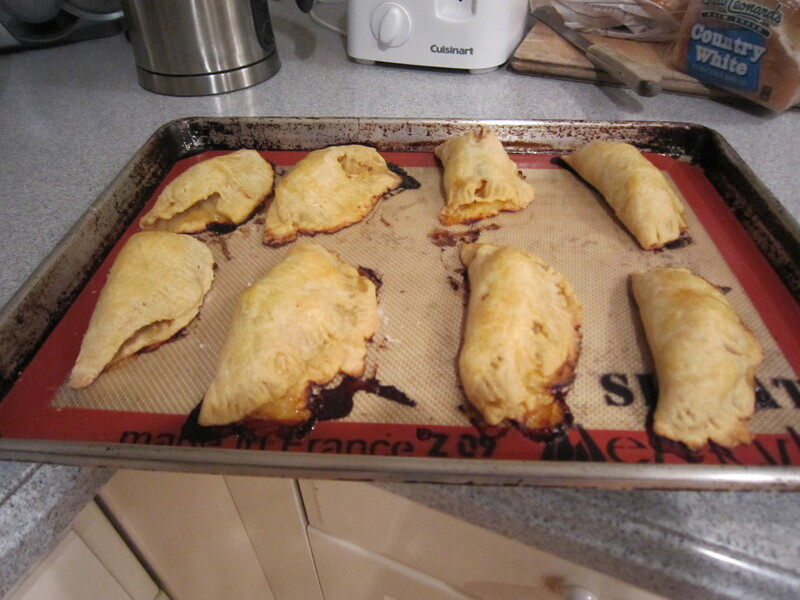 Empanadas, however, had never been seen in our kitchen until a couple of weeks ago, when I decided to try making them. My parents noted that they are essentially Cornish pasties, a British staple, with a different dough… but that didn’t help much, as we’ve always bought Cornish pasties instead of making them. So I was on my own here, hoping the sauce was the right consistency and inexpertly rolling out discs of dough to inconsistent thicknesses. I’m sure they would have been prettier (and maybe tastier) if I had had years of experience watching and helping someone make them, but I think they turned out pretty delicious regardless, and hopefully I will just get better at it. Next time, I would probably chop the chicken finer and thicken the sauce even longer, as I felt I ended up with mainly big chunks of chicken in these, instead of all the other delicious things. Empanadas, and especially these empanadas, are definitely not a quick dinner. The dough can be made ahead of time, and I would suggest making the filling well ahead of time, as well, so that you are not sitting around hoping it will hurry up and cool already. The original recipe from Smitten Kitchen/Gourmet made extra dough for the amount of filling. I went the opposite route and made more filling than dough (because I couldn’t be bothered thinking through too many conversions). I still came out with 12 empanadas, which left lots of leftovers after 3 of us ate them for dinner, and the filling was delicious on its own for lunch. I also accidentally had Mexican/fresh rather than Spanish/dried chorizo. It worked fine but required pre-cooking, which the Spanish would not. About 2 pounds chicken. Whole legs (including thighs), or whole bone-in breasts, split. Make Dough: Up to six hours ahead of time, sift flour with salt into your largest bowl. Cut butter into 1/2 inch cubes, and work into flour with fingertips or pasty blender until it resembles coarse meal, with some (roughly pea-sized) lumps. Beat together egg, water, and vinegar in a small bowl. Add to flour mixture, mixing with fork until just incorporated, the mixture will look shaggy. If bowl is big enough, gather dough in bowl and knead gently once or twice with heal of your hand until it just comes together. If your bowl is not big enough, do this step on a lightly-floured surface. Form dough into a flat rectangle and wrap in plastic wrap. Chill 1-6 hours. Make Filling: If using fresh chorizo, remove from casings and brown in large, heavy skillet over medium heat until some fat has rendered out. Drain fat and remove chorizo. Pat chicken dry and sprinkle with salt and pepper. Heat 2 tablespoons oil in the large, heavy skilled over moderately high heat until hot but not smoking, then brown chicken, turning over once, about 6 minutes total, and transfer to a plate. Halve onions lengthwise and then cut lengthwise into 1/4-inch-wide strips. Mince garlic cloves. Saute onions, garlic and bay leaves in fat remaining in skillet, stirring frequently, until onions are softened, 4-5 minutes. Add chorizo and paprika and cook, stirring, 1 minute. 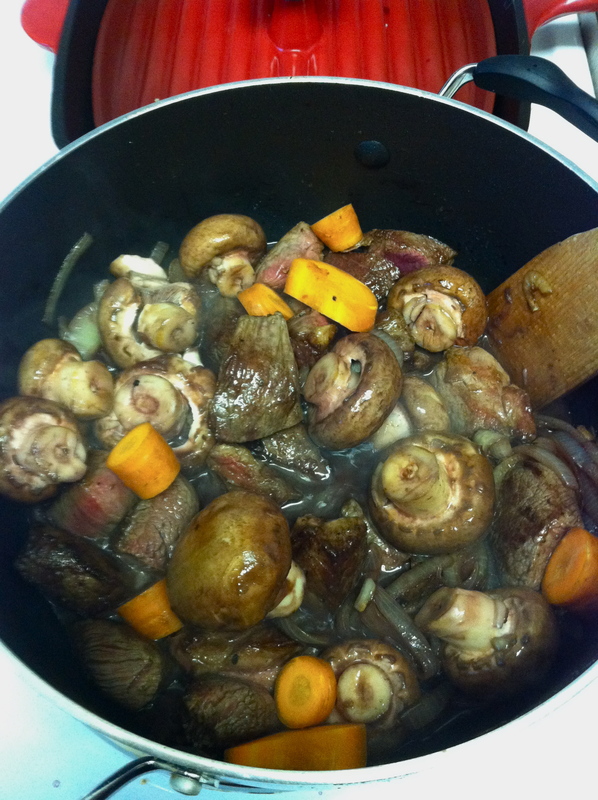 Add olives, wine, and broth and bring to a boil, stirring and scraping up any brown bits. 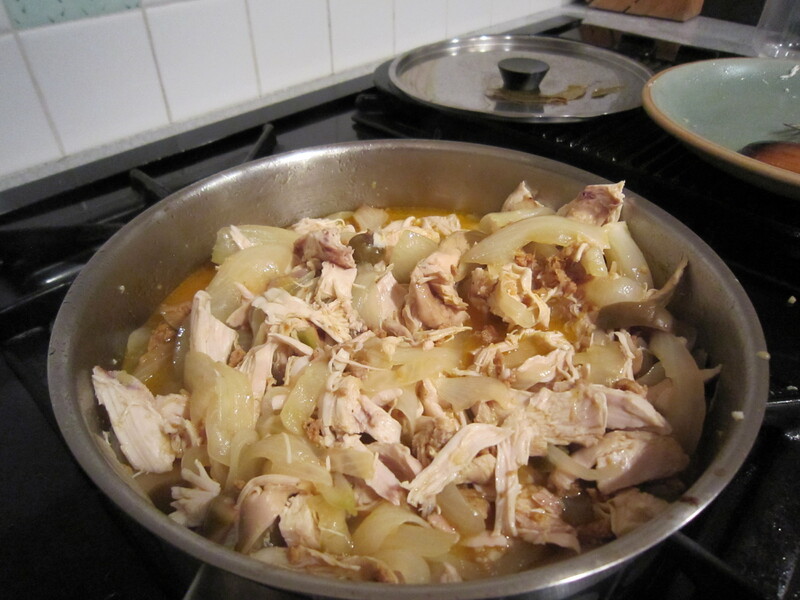 Return chicken to skillet along with any juices accumulated on plate, then reduce heat to moderately low and simmer chicken, covered, turning over once, until tender, 25 to 30 minutes total. Transfer chicken to a clean plate. (Sauce in skillet should be the consistency of heavy cream; if it’s not, briskly simmer until slightly thickened, about 5 minutes.) (Gina’s note: no idea if my sauce was the right consistency, but it seemed pretty thin even after simmering for a few minutes. )When chicken is cool enough to handle, discard skin and bones and coarsely chop meat. Stir chicken into sauce and discard bay leaves. 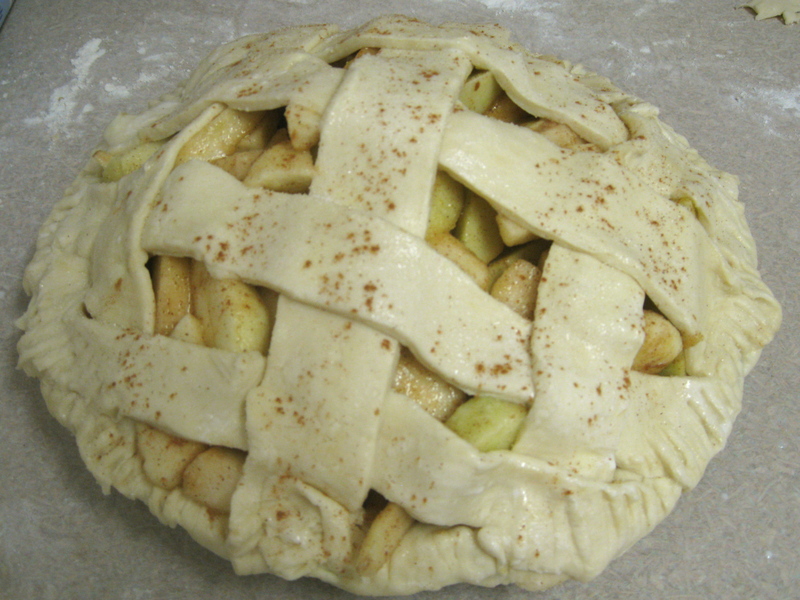 Season with salt and pepper, then cool filling, uncovered, about 30 minutes. Form Empanadas: Put oven racks in upper and lower thirds of oven and preheat oven to 400°F. Divide first dough into 12 equal pieces and form each into a disk. Keeping remaining pieces covered, roll out 1 piece on a lightly floured surface with a lightly floured rolling pin into a 5-inch round (about 1/8 inch thick). 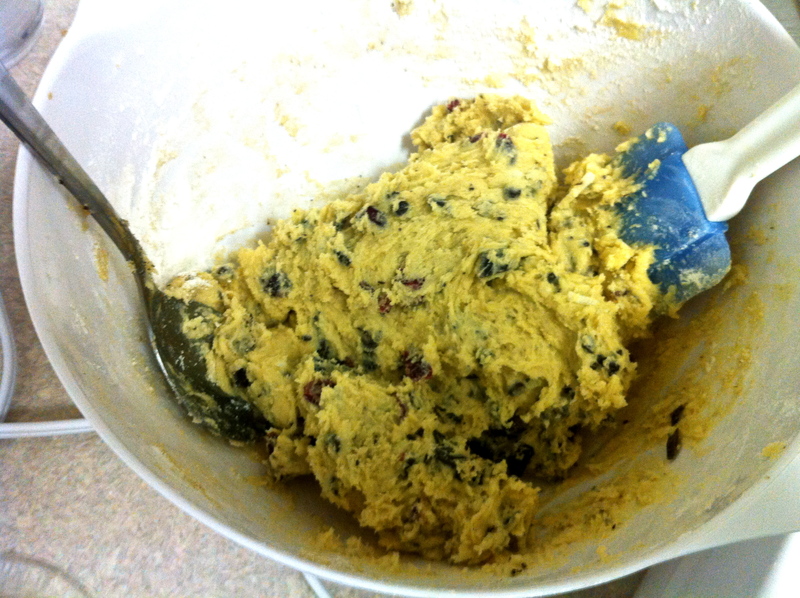 Spoon about 2 tablespoons filling onto center and fold dough in half, enclosing filling. Press edges together to seal, then crimp decoratively with your fingers or tines of a fork. Transfer empanada to a baking sheet, lined with a silicone mat or waxed paper. 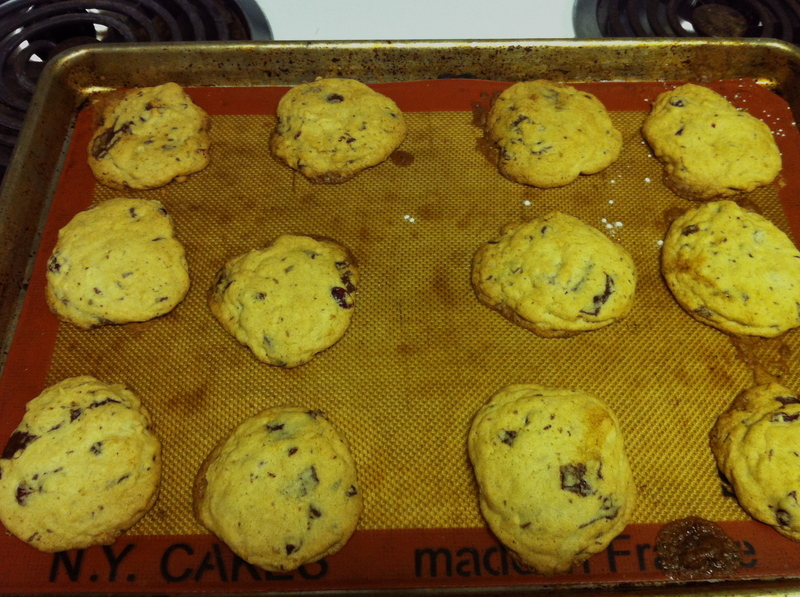 (Mine stuck fiercely to parchment paper.) Make eleven more in same manner. Beat an egg with 1 tbsp of water. Lightly brush empanadas with some of egg wash and bake in upper and lower thirds of oven, switching position of sheets halfway through baking, until golden, about 25 minutes. Transfer empanadas to a rack to cool at least 5 minutes. Serve warm or at room temperature. 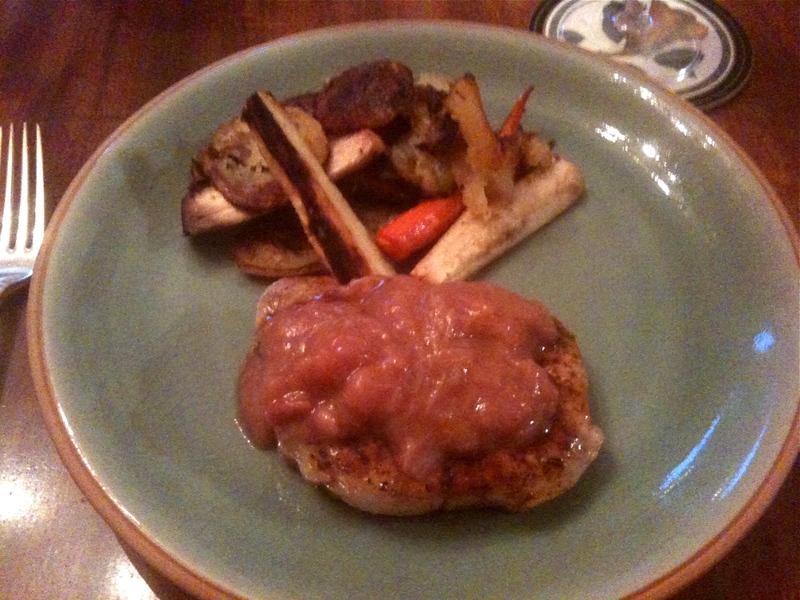 Rhubarb compote, pork chop, and roast veggies. Yum. I am a huge rhubarb fan, and have been craving some delicious rhubarb baked goods since the season started. But last night we were having pork chops for dinner, and I thought I’d pick up some rhubarb to try it out in a savory dish. We often make an apple-onion compote to go with pork chops, so I thought I’d sub in rhubarb for the apple and see how it turned out. 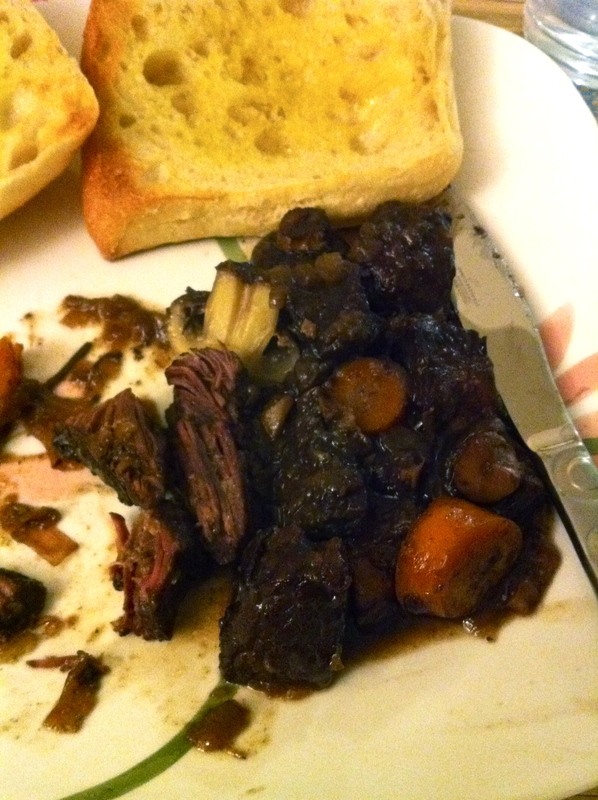 I was pretty pleased with the results, though it hasn’t quite satisfied my craving for strawberry-rhubarb pie. Method: Roughly dice onions. Discard ends of rhubarb and chop into half-inch pieces. Melt butter in heavy-bottomed saucepan over medium-low heat. 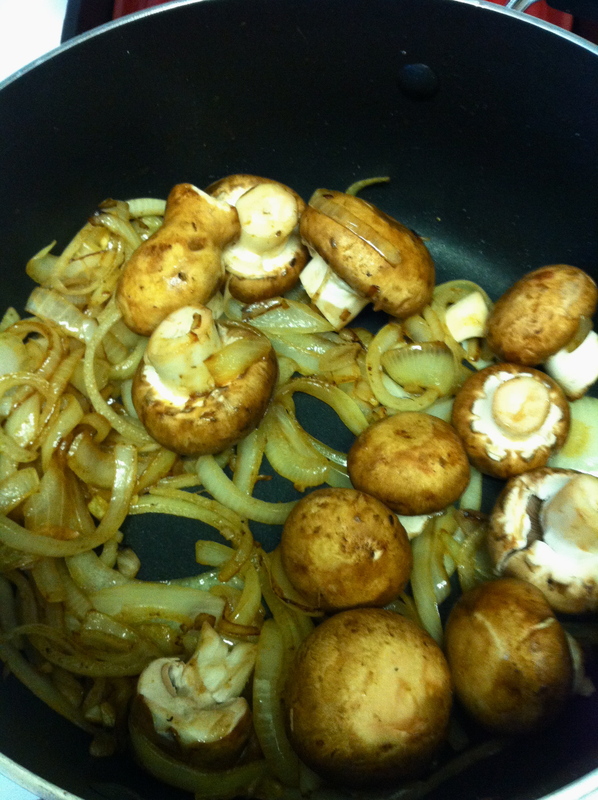 Add onions and cook over low heat until they are starting to soften, a few minutes. Add rhubarb, balsamic, and about a tablespoon of sugar, and ginger. 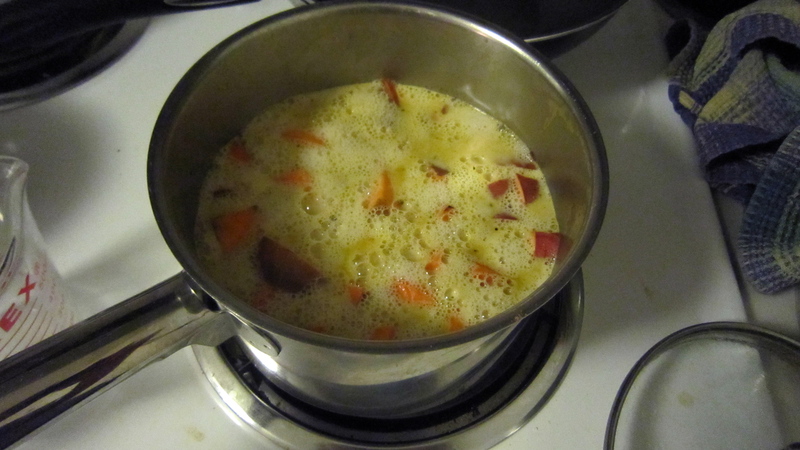 Turn heat to low, and simmer for about fifteen minutes, stirring occasionally and making sure the bottom isn’t burning. Add a splash of water if things are starting to look dry, but rhubarb has a lot of water in it. Taste after fifteen minutes. If it is too tart, add more sugar. Rhubarb is quite tart, but the onion provides some sweetness as it cooks. It is done when the onion has lost all of its crunch. Serve over grilled pork chops. 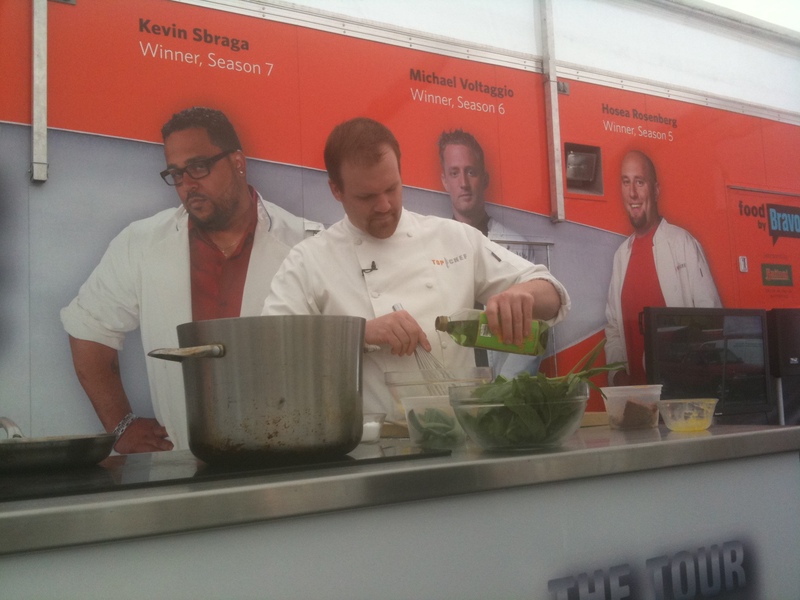 In other food-related news, the Top Chef tour stopped at the Stew Leonard’s near us today, so I went to check it out. 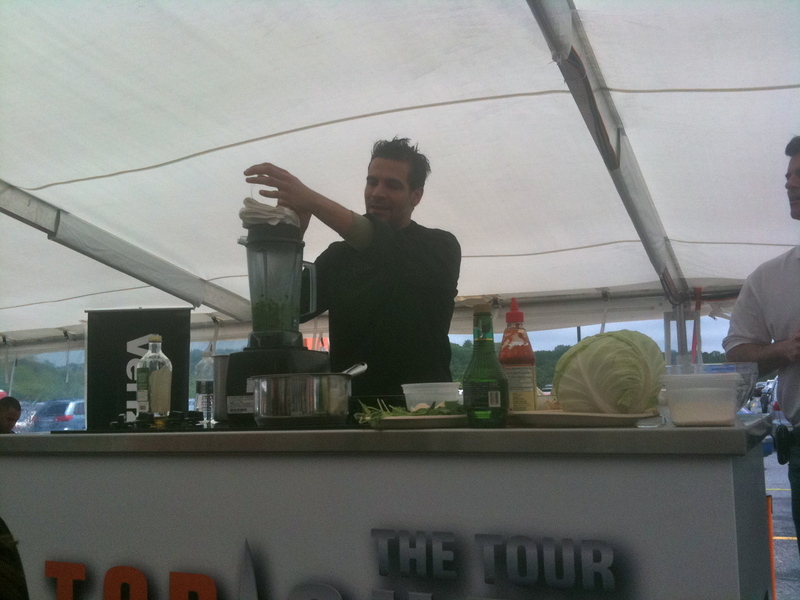 The basic idea of this tour is that they have two previous contestants, who come up and have fifteen minutes to make a dish using certain ingredients (they were given some time to prep beforehand, so this wasn’t exactly like the high-stress quickfires on the show). Then judges decide which chef wins. 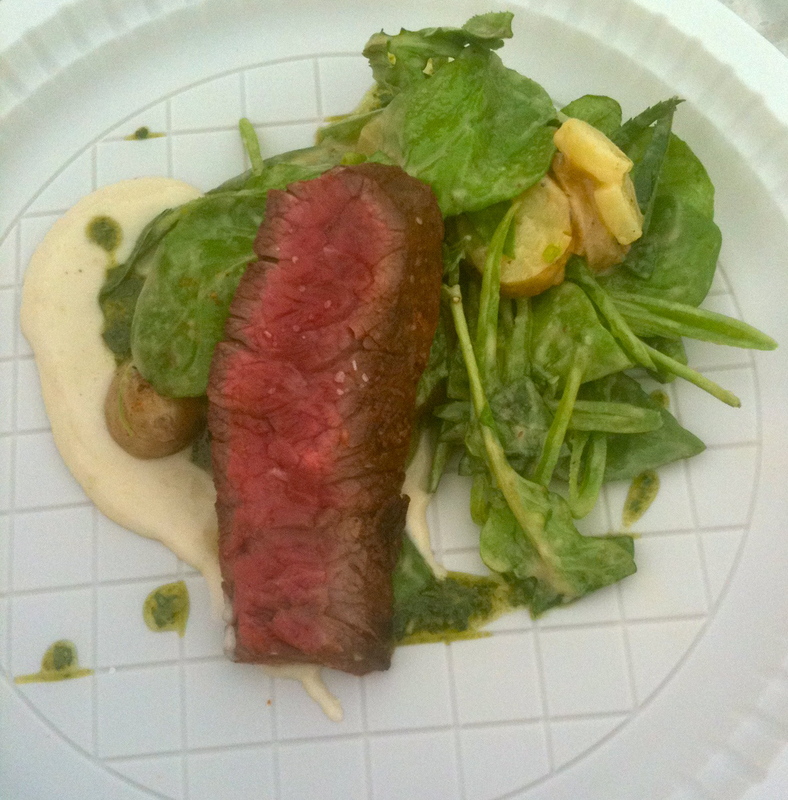 There were two judges from Foodspotting already there, but they picked one from the audience as well. Thanks to my Top Chef trivia knowledge, I got picked! 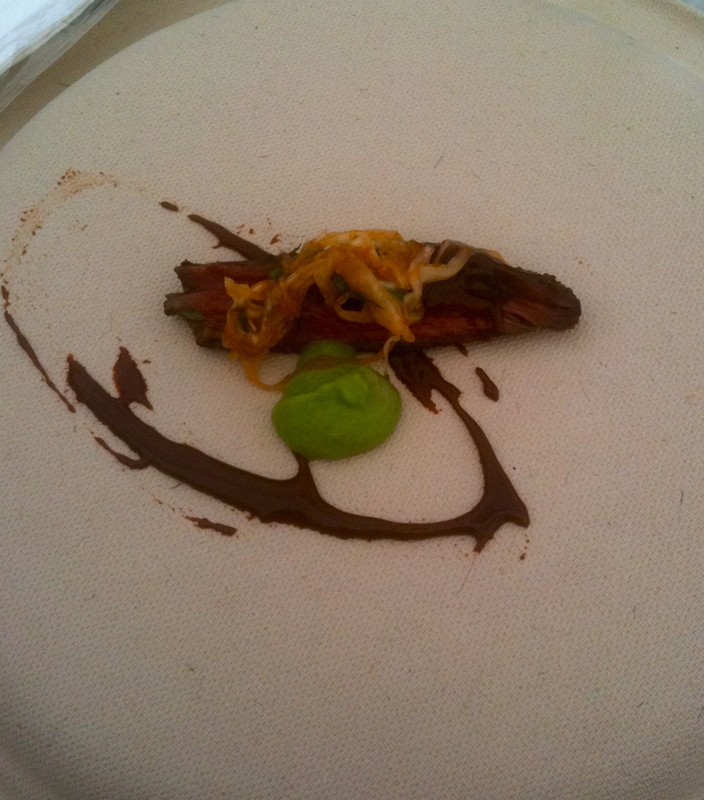 The two chefs were Ash and Angelo, and the food was delicious. Angelo, of course, went all Asian-inspired with a mock kimchi and a spicy chocolate sauce on his beef (the sauce was incredible, but kind of overpowered everything else). Ash made a very fresh herby salad, with an amazing aioli that he made in front of us. 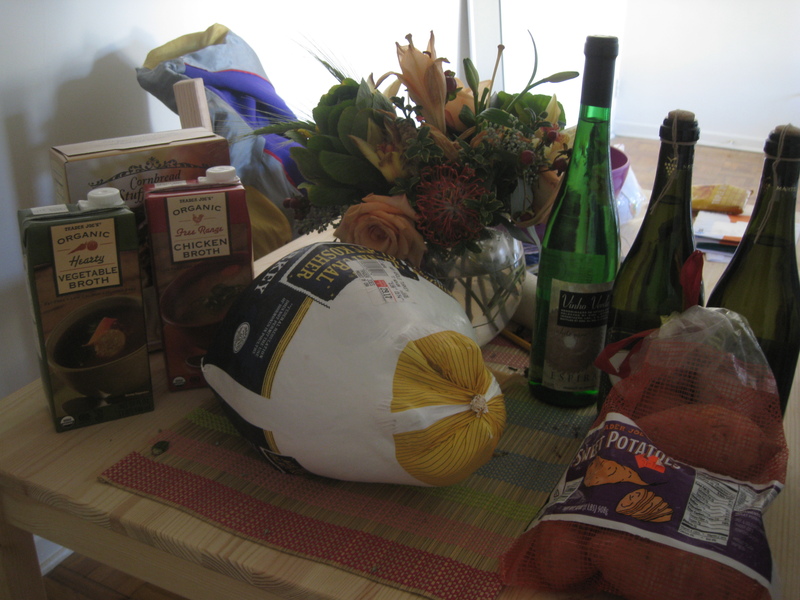 We went with Ash as the winner, though I might try out that sauce of Angelo’s when the recipe goes up online. It was fun being able to chat to the chefs and eat the food that I’m always craving when I watch the show… definitely check out if the tour is stopping by near you! I am a big fan of mac and cheese, in basically any incarnation, from the instant stuff from a box (although since I started making my own I haven’t gone back to the powdered stuff, however easy it may be), to fancy-pants mac and cheese with bacon and truffles, etc, at top restaurants. This shouldn’t come as a surprise to anyone who knows me, as clearly I love anything that starts with half a stick of butter and ends with a cup of cheese. I started making skillet mac and cheese last year, with farfalle as the pasta, but this year I have had a mac and cheese revelation of sorts, and started making it with gnocchi instead of traditional pasta. While it is true that this takes out the “mac” part of mac and cheese, it makes an unbelievably good companion to the cheese sauce, and somehow doesn’t feel too heavy to eat a whole plate of. Even if you are basically eating potato pasta and cheese. Gnocchi is easy and cheap to buy in sealed packs at most grocery stores, and only takes about 4 minutes to cook. I still make a skillet version, which means I toss the gnocchi with the cheese in a frying pan, then top it with more cheese and put it in the oven to bake. This recipe is very adaptable to whatever your own tastes are- I put some fresh herbs like rosemary and basil in mine, and also a bit of pesto to up the flavor, but you can leave all of that out or go experimenting with other spices and herbs. 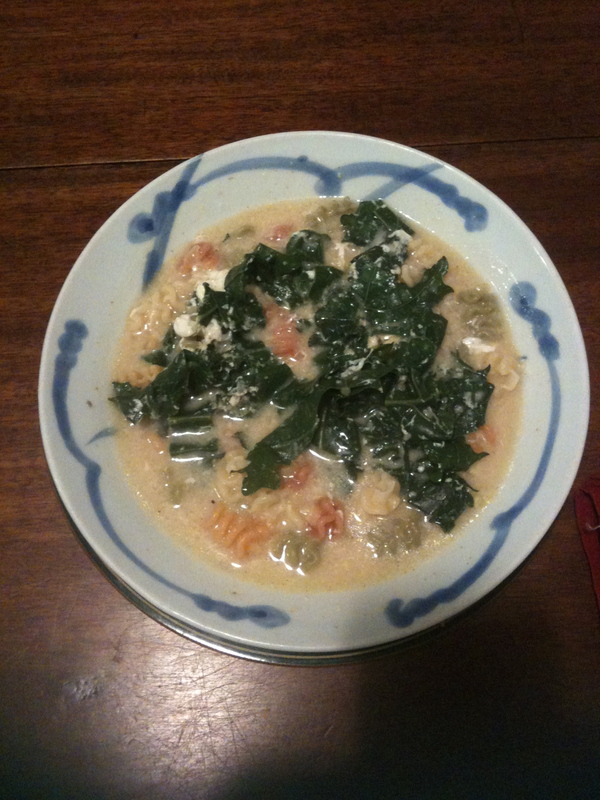 You can also use basically whatever cheese you like, although I do usually use at least two different kinds. Gruyere is amazing but pretty expensive, however I, being a lover of baked potatoes and grilled cheese sandwiches, almost always have my parents buy me some when they are here. This time I used mainly cheddar (DEVON cheddar from Trader Joes, which is the best cheddar that is, and I’m not only saying that because my family is from Devon), a bit of Gruyere, and Parmesan for the topping. Finally, if you’ve never made a roux before, which is the flour-and-butter starter for any white pasta sauce, don’t be too scared. The key is to keep the heat on medium-low and whisk, whisk, whisk, so that the flour doesn’t burn. Preheat oven to 375. Prepare gnocchi according to package directions, drain and set aside (it will probably stick together, but just pull it apart before you mix it into the cheese sauce). Meanwhile, start making the roux for the sauce. 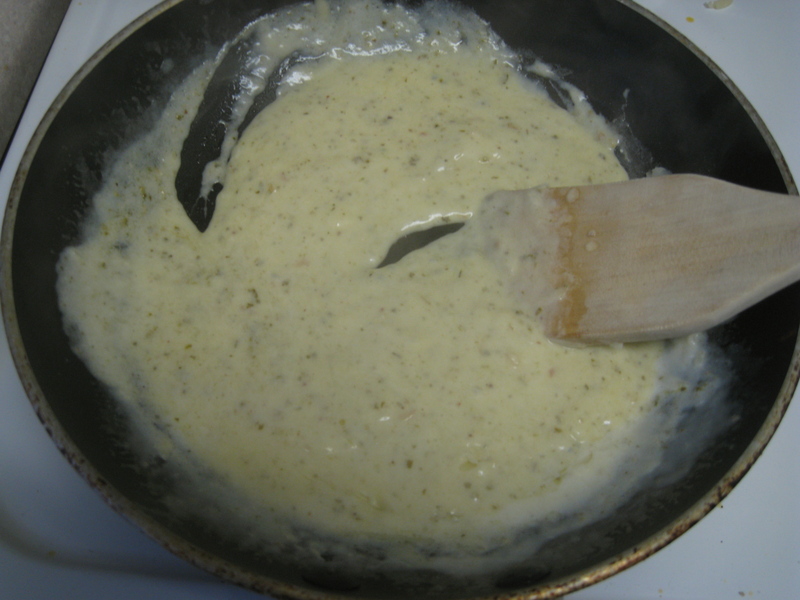 Melt butter in the frying pan over medium heat, then add garlic and cook for about 30 seconds longer. Sprinkle in the flour and whisk until it starts to bubble. Then slowly pour in the milk and continue whisking until a thick sauce is formed. Keep on very low heat or take the pan off the heat and add in the Dijon, pesto, and cheddar and Gruyere cheeses. 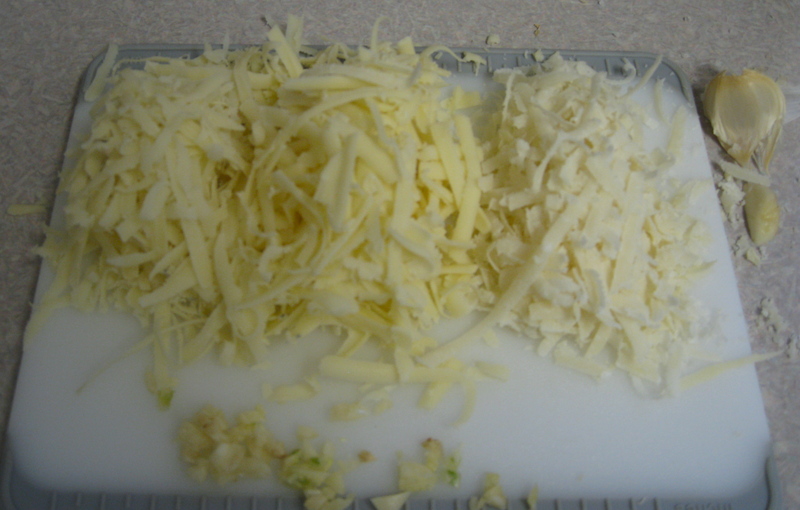 Once all the cheese is melted, season with salt and Pepper. 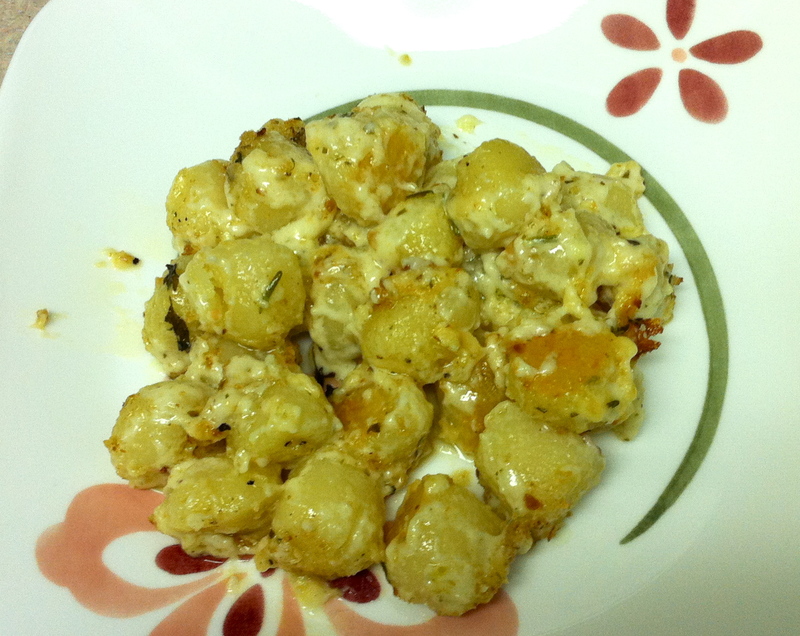 Add gnocchi to the frying pan and toss to coat with cheese sauce. Add in chopped basil and rosemary, and sprinkle the Parmesan and breadcrumbs on top. Bake until top is golden and cheese is bubbling, about 20-25 minutes. Gina was the first one of the Ginger Spices to make these cookies, but I have made them several time since and have no intention of stopping. 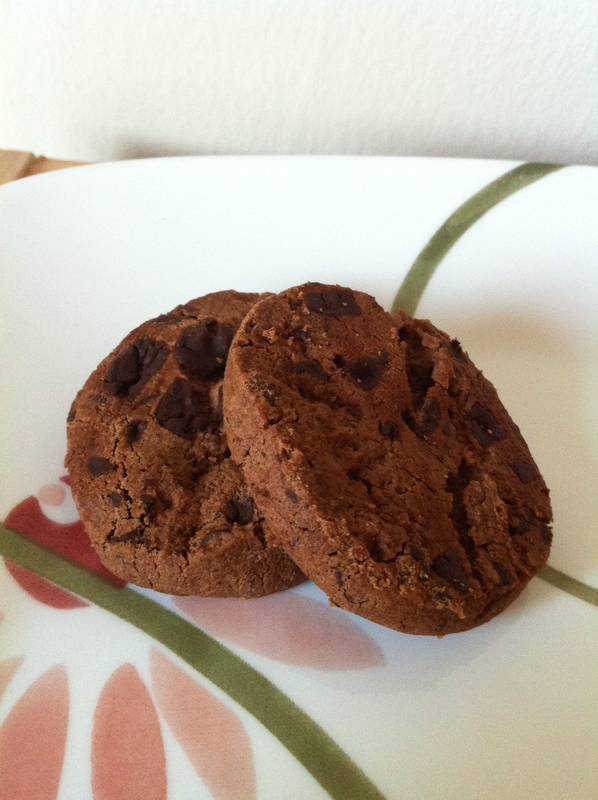 They are seriously delicious, melt in your mouth chocolaty, and on top of that are very simple, utilizing ingredients that I almost always have in my kitchen anyway. I first read about them on Smitten Kitchen, which is where the “World Peace Cookies” name came about, and if you think that name is exaggerating the power of these cookies, you only need to try them to be converted. I firmly believe that if served to any friend, boss or person you are trying to impress they will be immediately won over, and will continue to ask for “Roxie cookies” (or “Insert-your-name-here cookies”) every time you see them henceforth. I personally have a certain friend’s mother who tried one of these intending just to taste one, then ate about three more, and now apparently asks after me all the time (admittedly, said friend may be exaggerating/this may not have to do solely with my baking skills, but I choose to believe in the power of cookies above all else). 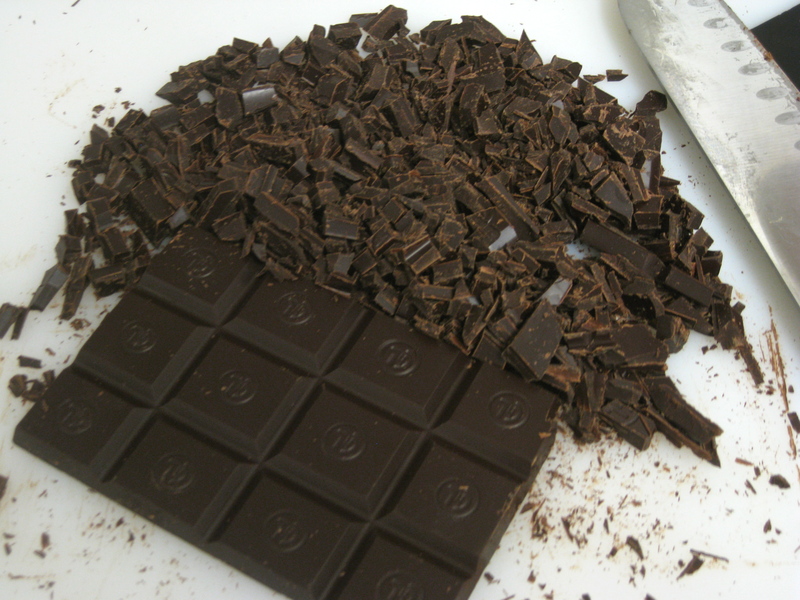 Chopped chocolate. Say that three times fast. I think it’s the texture of this type of cookie that make them so strange and addictive- they are apparently known as “sandies”, which makes sense because the dough sort of resembles sand and they crumble easily. They also have a lot of brown sugar in them, which always reminds me of sandcastles, so I like to think that fact is somehow related to the name. All you really have to do is chop some chocolate (which is super fun, therapeutic, and gets chocolate all over your hands in the best way possible), cream the butter with a stand mixer or hand held mixer, and then add all the ingredients until a dough forms. The recipe makes a large amount, but trust me, you want to make it all. Plus you divide the dough into two pieces to chill, so can easily bake one that day and save the other for a few days later when friends are banging down your door begging for these. Or just for when you find you have eaten 25 cookies in three days and want some more. They also keep very well in a container at room temperature, and as they are not chewy they last for about a week if for some crazy reason you see reason and decide not to eat them all in a day like me. Sift the flour, cocoa, and baking soda together. 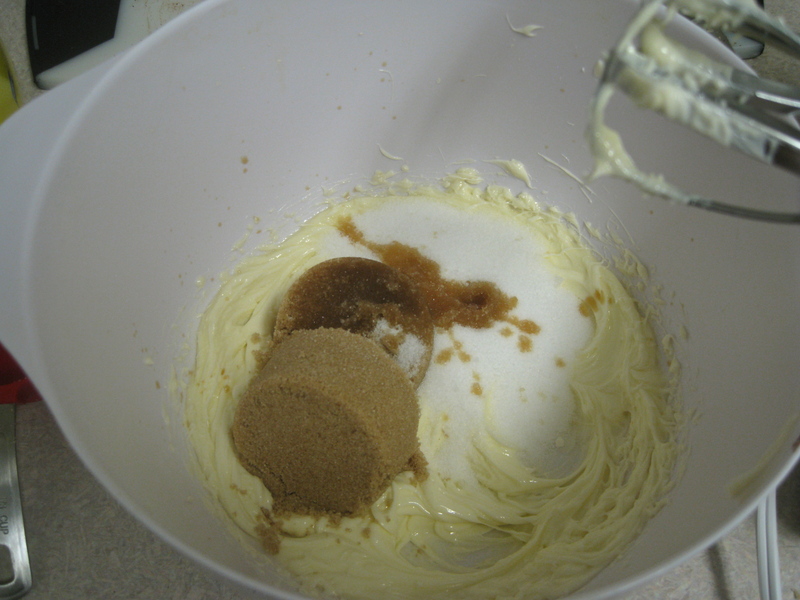 Working with a stand mixer or with a hand mixer in a large bowl, beat the butter on medium speed until soft and creamy. Add both sugars, the salt and vanilla extract and beat for 2 minutes more. Turn off the mixer. Pour in the flour and mix at low speed about 5 times, a second or two each time. If there is still a lot of flour on the surface of the dough, pulse a couple of times more. Continuing at low speed, mix for about 30 seconds more, just until the flour disappears into the dough — for the best texture, work the dough as little as possible once the flour is added, and don’t be concerned if the dough looks a little crumbly. Toss in the chocolate pieces and mix only to incorporate. 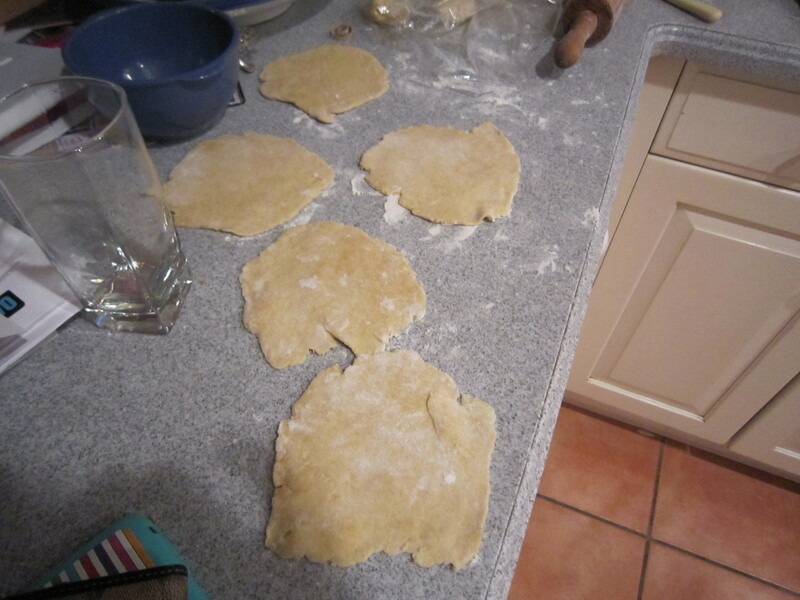 Turn the dough out onto a work surface, gather it together and divide it in half. Working with one half at a time, shape the dough into logs that are 1 1/2 inches in diameter. Wrap the logs in plastic wrap and refrigerate them for at least 3 hours. Logs can also be frozen for a couple of months if desired. When you are ready to bake, preheat oven to 325 and line baking sheet with parchment or silicone mats. Slice logs with a sharp thin knife, if they fall apart just form them back together on the baking sheet. 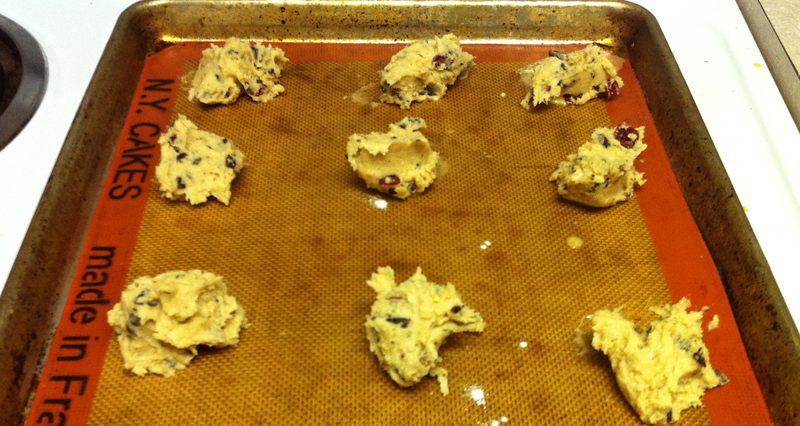 Put them on the baking sheet with about an inch between (one log needs two batches), then bake for 12 minutes. They will still look very soft, but take them out and let them cool until they have hardened and can be handled. Enjoy, and store any extras in airtight container!